DESCRIPTION SWG Motorsport have expanded their range of unique VAG gauge holders to incorporate a new model. You are looking at a brand new air vent gauge pod holder which has been exclusively designed by SWG Motorsport to fit all VW T5 variants (2004-2013). This unique bit of kit has been designed to look exactly like the original air vent but now allows any 52mm gauge of your choice to be seamlessly mounted into the dash (great for adding a boost gauge etc), this is ideal for adding extra instrumentation while still keeping the classy interior looking original, now there’s no need for unsightly add-on dash pods or any untidy wiring on show. 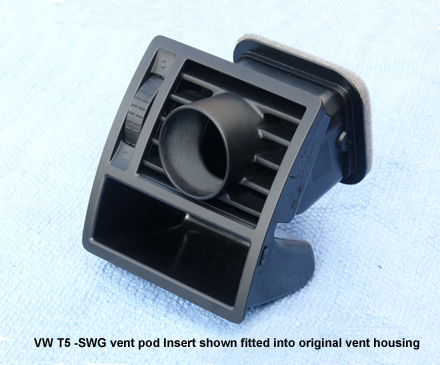 Firstly this item featured here is an easy to fit clip-in pod insert only, which simply clips into the existing housing replacing the original vent slats. Prices start at just £44.99 for the insert. Both options are exclusive to us and only available direct from SWG Motorsport, we also offer a range of OE style gauges which match the VW dash lighting as well as complete gauge and holder kits.